Have an eye bags? You should be proud and happy, because this is the trend that is booming in South Korea. Eye bag then named aegyo sal, or could be interpreted smiles eye, or eyes smiling. Actually, almost all Asian women have lower eyelids, but not all categories of eye bags sometimes called as aegyo sal.Aegyo sal is the symbol of cuteness and Younger. Many women want to have aegyo sal because it shows the impression of smooth, cute and youthful. Look at the South Korean celebrities who have Aegyo Sal naturally (see photo article! ), SNSD Yoona is known to have the cutest faces in the group. Ku Hye-Sun 29 years old this year, but look he often plays a teenager. Even Song Ji Hyo 31-year-old stay young and still be an idol in the Running Man. That is some greatness aegyo sal. 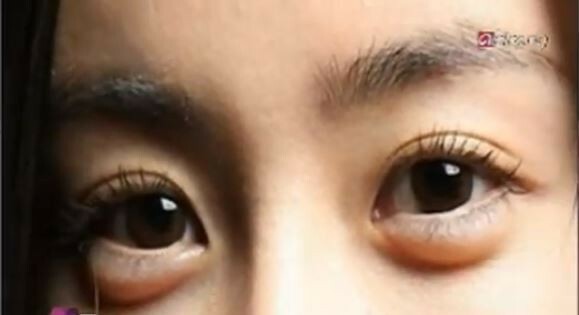 If someone is interested in doing plastic surgery to have aegyo sal, the fat under the eye line will be added. This process uses self fat in the abdomen, thigh, or hip area is taken a little, and then grafted on the bottom line of the eye area. That way, there will be bumps aegyo sal that appear cute when she smiles.